Dr. Marco Campos graduated with honors from the University of Texas Medical Branch at Galveston where he was inducted into the Alpha Omega Alpha Honor Medical Society. He completed his residency in internal medicine at New York Presbyterian Hospital in New York City, New York, where he served as an assistant chief resident. He then completed his fellowship in cardiology at Baylor College of Medicine in Houston where he served as chief fellow for cardiology and interventional cardiology. 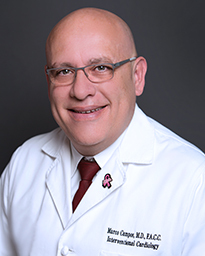 Board certified in internal medicine, cardiology, interventional cardiology and adult echocardiography, Dr. Campos has clinical interests that include the diagnosis and treatment of heart failure, coronary artery disease, peripheral vascular disease and venous disease. Dr. Campos offers cutting edge, evidence- based patient care and believes in providing personal and attentive care to each patient. In 2013, he proudly joined his father, Luis. A.Campos, M.D., in the practice of cardiology. Dr. Campos is site director for the interventional cardiology fellows at Memorial Hermann Heart & Vascular Institute-Memorial City. In his spare time, Dr. Campos enjoys spending time with his family.